“Our chef isn’t going to enter recipes into a data base.” WHAT!? was the look on my face. The owners are building a new kitchen and are looking at software for the operation. They stopped by the booth at the NY Hotel Show I was working, looked at kitchen management software, liked the system, and as they were leaving said their chef would never add recipes. And these owners seemed ok with their situation. Come on, already. Who’s driving the boat? To all chefs, culinarians, cooks, food preparers, and anyone in the food business – if you aren’t engaging technology, you’re being left behind. The technology available today is easy to use and will help your operation. The first topic of my newsletter in June was recipes. In that article I wrote, “Recipes drive ingredient selection, equipment selection, china selection, production schedules, and labor schedules, to name a few operational topics.” The purpose of writing about recipes was to reinforce their value to good operational processes. In a foodservice operation a recipe is a valuable tool, especially when the recipe is dynamic. A dynamic recipe is cool. When a recipe is part of a functional kitchen management system it is scalable, cost aware, ingredient driven, menu accessible, nutritionally defined, photographically represented, and a handful of other useable topics. All important tools to effectively run a successful operation. Take scalable for example. Chefs know, mostly from trial and error, that all ingredients cannot be calculated equally when scaling a recipe. Scaling meats, vegetables, and liquids generally work using a recipe conversion factor – desired yield /original yield=recipe conversion factor. What doesn’t scale this way are the spices, salt, dried herbs. To accurately scale spices (and, actually, all ingredients) each ingredient must be calculated as a percent of the whole. A dynamic kitchen management system has this function built in. This is a complex computation done in the background and is easy for the operator to use. Scaling ingredients using percentages provides chefs with accurate ingredient quantities, which results in consistently delicious food. A fundraiser was held November 3rd at the Petersen Automobile Museum in LA in November to support the efforts of www.rettsyndrome.org It was a privilege to be a part of the group of chefs that served up food to the attendees. A group of local culinary students teamed up with the chefs in attendance to get hands-on experience in a live culinary event. The most memorable part of the evening was learning about and meeting the afflicted girls and also meeting their amazing family members. In September I joined the CIA Consulting team of chefs in Dayton, OH for the training and implementation of the US Air Force Go4Green food initiative. This program refocuses the dining experience on air force bases globally. One of the main focuses is to offer flavor-forward plant-based recipes for airmen and airwomen. The CIA Consulting team worked with Air Force chefs and operations managers from several air bases in the country. The CIA Consulting team worked with the group to not only maximize the taste of food, but also presentation of food on a hot and cold service line. We also dove into the importance of planning and organization in food production. This was the first of several global implementation locations. The following is personal story. I share with great pleasure that my wife, Sylvia, has been recognized as the 2018 Staff Member of the Year by the Shoreline Chamber of Commerce, CT.
I’m overjoyed that Sylvia is recognized for the wonderful and valuable contribution she makes to over 100 seniors living in our community. Congratulations, Sylvia! My niece arrived from Germany 2 weeks ago and had a very special treat – lebkuchen. Not any old lebkuchen, Nürnberger lebkuchen! Lebkuchen dates back to the 13th century and is made from nuts, spices and honey. It is reportedly from the Franconian region of Germany (northern Bavaria). These cookies are baked on a wafer and are soft to the bite. Most are glazed….dark chocolate, please! I look forward to lebkuchen this time of year, and once again, I wasn’t disappointed. I end this newsletter and 2018 with my sincerest gratitude to so many people. It has been my good fortune to work with dozens of creative, professional, inspiring, and caring people. To everyone reading this, please accept my best wishes for a Happy Holiday and healthy wishes for a wonderful New Year. CulinaryNXT is a food service advisory practice drawing on Ron DeSantis’ 30 years of experience in all facets of the food industry. 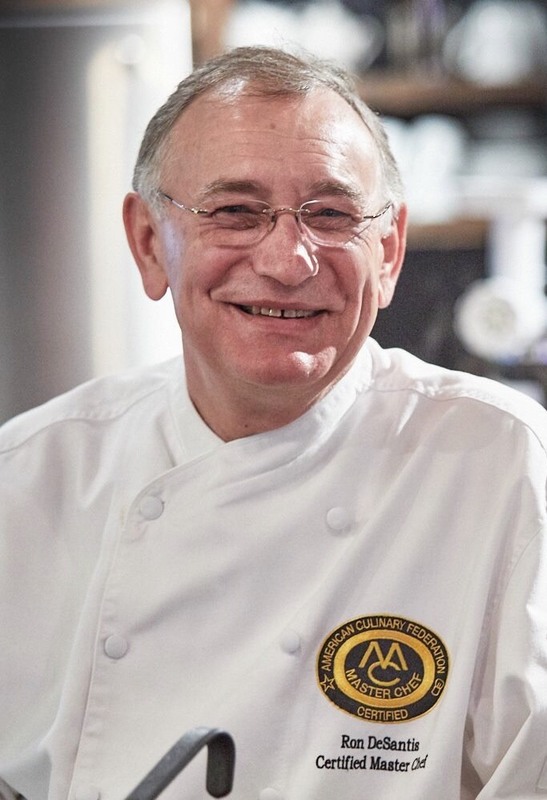 Ron is one of only 68 Certified Master Chefs worldwide and has advised organizations of all sizes and types. His strengths include culinary innovation, menu and recipe development, culinary assessment, bottom-line results, and communication skills that allow him to implement solutions effectively. CulinaryNXT’s base is in New Haven, but its reach is truly global. CulinaryNXT’s relationships extend to numerous countries around the world in a client and alliance network that has been built over many years. These relationships provide both global support and local knowledge.